Lightweight Vacuum Cleaners – Morphy Richards 732000 – cordless and simple to use! Morphy Richards love their upright vacuum cleaners doubling up as handheld cleaners. Other manufacturers have created the same, but never as well priced. The 732000 is indeed lightweight at less than 4kg and although the bin capacity of the machine is pretty small (0.3 litres), it has proven to be a hit with customers. Not only is it a fine upright, but the power is fairly decent for a cordless. It’s not going to clean your carpets as well as a mains powered unit, no, but for a quick clean around the home, it is ideal! As with most cordless machines, the usage time will be low (approx 20 minutes). That’s only going to be enough time for a quick whizz around, so it’s not going to be ideal for a thorough clean in a large home. The swivel steering will appeal to many who have struggled manoeuvring around furniture and the 732000 glides around with ease. The crevice tool, upholstery nozzle and dusting brush sit neatly on the main body and the bin container can be easily removed to empty. How about cleaning your car? Simply detach the handheld unit from the main machine and clean your car. We’ve found the handheld unit excellent to use on cat and dog beds! The accessories can be connected to the handheld unit too! 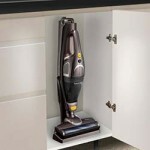 When not in use, the vacuum cleaner can be stored in its cradle and charged. The handle can be flipped down to reduce the amount of space it takes up. Cordless, so no need to worry about plugs and cables!